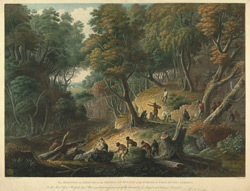 An aquatint (from a painting by F. J. Bourgoin) depicting British troops caught in an ambush by a group of Maroons in 1795. The men and women known as Maroons were former slaves and their descendants who had founded settlements in the remote hills and forests. Many of them had managed to escape from servitude when the British invaded the Spanish colony of Jamaica in 1655; others were successful runaways from captivity on British-owned plantations. After decades of waging war against the colonists, raiding the plantations and encouraging enslaved workers to rebel or escape, the two main Maroon groups finally signed treaties with the British in 1739-40. The treaties recognised the Maroons' freedom and provided land and some political autonomy in exchange for peace. By the end of the century, however, there was general discontent about the quality of the land that had been allocated to them, and this, together with a sequence of other events, caused the start of the second Maroon War in July 1795 by the Trelawney Town Maroons. They managed to hold out against the superior numbers of the British troops for some months but by March 1796 the war had been lost. The Trelawney Town Maroons were all deported and exiled to Nova Scotia until 1800, at which time they were moved to Sierra Leone.